If you and/or your children are fans of Cartoon Network, or just cartoons in general, then you will definitely want to read this comic book. Published by IDW, Super Secret Crisis War is a six-issue mini-series featuring some of the network’s most beloved heroes and villains. 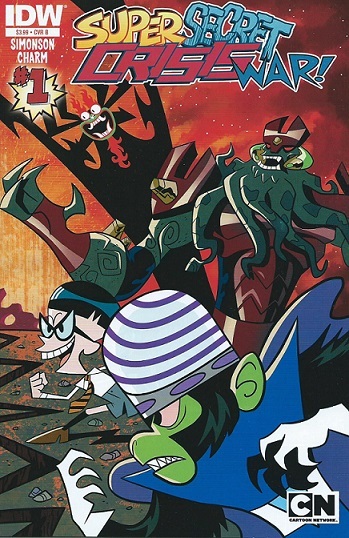 The demon, Aku, formed the League of Extraordinary Villains, a group of Cartoon Network’s most notorious villains. Their mission is to capture and control the power of the heroes, and conquer their worlds. The league sends evil robots to fight the heroes. If the robots are defeated, the heroes get transported to the league for the next phase of their villainous plan. We all know that Ed, Edd, n Eddy combined doesn’t make the sharpest tack in the box, but hey, they were targeted by an evil robot. Five one-shots are included in this mini-series. Below are the titles and month of release. Louise Simonson is the writer. Well-written script. Funny dialogue and character interactions. I couldn’t help but to hear the characters voices in my head while reading this hilarious comic, especially Mojo Jojo and Ed, Edd, n Eddy. Beautiful artwork by Derek Charm. Fine details. Bright and colorful panels that kids will love and enjoy. There is no doubt that I am going to read this entire mini-series. I just wish that I was in this comic. I would steal Ben 10’s omnitrix, and ask Dexter why is he the only person in his family that talks with an accent. If you are looking for comic books for your kids, then I strongly recommend this all-ages comic mini-series. I am giving this issue 5/5 stars.